Most people have heard of birthstones, but did you know that there are also flowers associated with birth months. From popular flowers like the Rose, to more surprising ones like the Snowdrop, we have all the details you need. January has two flowers that represent those born during this month; carnation and snowdrop. 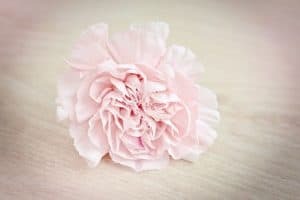 The carnation got its name the word coronation, as it was one of the flowers used in ceremonial crowns by the Greeks. Carnations naturally grow in 6 colors, although with the use of dye, any color can be created. Carnations represent purity, luck and love. All great things to be associated with! The other flower for those born in January is the snowdrop. 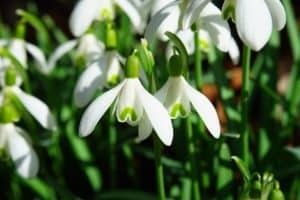 The legend behind the snowdrop flower is one of hope. It is said that when Adam and Eve were sent away from the Garden of Eden into a harsh winter, that they thought the snow would never end. An angel then suddenly transformed the snowflakes into flowers, giving them hope that things would soon get better. Snowdrops actually produce their own heat, which melts the snow around them when they grow. What a magical little flower to give to someone born during this month. 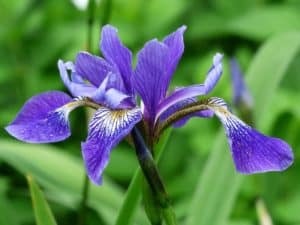 The iris is the flower for those born in the month of February. Named after the Greek goddess Iris, it is said to provide a connection between heaven and earth. In ancient Greece irises were planted on the graves of people to summon the goddess to bring them to heaven. It became popular again during the Middle Ages, eventually becoming the symbol of the French monarchy. The fleur-de-lis , as they call it, is still their national symbol. People born in this month are said to have the same characteristics as the iris; wisdom, faith and valor. The darling daffodil is the flower for people born in March. This flower has many things in common that are associated with this month, especially rebirth and new beginnings. 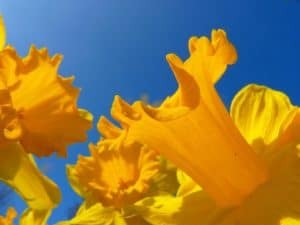 In England it is believed that if you spot the first daffodil of the season, you will have great luck for the rest of the year. The Chinese believe that growing daffodils in your home will also bring prosperity. The daffodil represents the same thing as a birth during this time of year; happiness and a fresh start. The popular daisy is the flower for people born during April. This flower has a long history of representing children, childbirth, transformation and hope. The Celtic people believed that whenever an infant died, God would make daisies appear to cheer the parents up. In Norse mythology, the daisy was the chosen flower of Freya, the goddess of love and fertility. 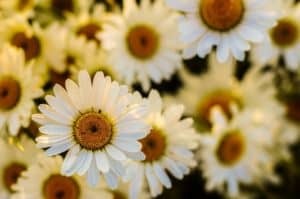 Daisies are actually two flowers combined into one, which makes its connection to the joining of parents creating a new life even more beautiful. Although this flower is often used during Easter and weddings, it is also the flower for anyone born in May. 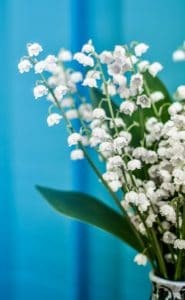 Lily of the Valley has a strong presence is Christian mythology due to its 15 references in the Bible. The most significant of these is the story of Mary, whose tears made the flowers appear out of the ground. In German mythology the flower is linked to the virgin goddess of spring Ostara and symbolizes life. For those born during this month Lily of the Valley represents humility, sweetness and purity. People born during the month of June have one of the most recognizable flowers , the rose. As far back as the ancient Greeks and Romans, this flower has been associated with love. It has been used for centuries as a way to convey strong emotions. There are many different colors of roses, all of which express a type of love or deep emotion. To be born during this month and associated with such a strong symbol of love is a very special thing. 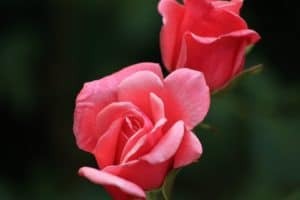 You can learn more about the meaning of rose colors on our post. The flower for people born in July is the lovely Larkspur. This flower represents those of us who are carefree and lighthearted. Greek legend says that during the Battle of Troy the warrior Ajax was so upset at losing that he threw himself onto his sword and his blood caused larkspurs to grow. In Victorian times these were very common flowers to be given between friends with whom someone might also have a romantic interest. 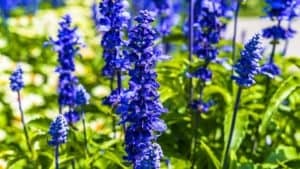 If you were born in the month of July hopefully you share the carefree and lighthearted traits associated with the beautiful Larkspur. Do you know anyone born in August who is an example of strength and moral integrity? Then they certainly have something in common with their birth month flower. Named after the Latin word for sword, they have represented strength and moral integrity for hundreds of years and through many cultures. 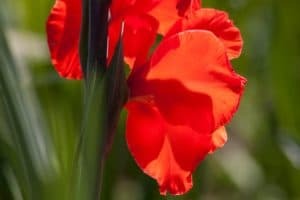 These flowers became so popular in the early 1900s that the American Gladiolus Society was started in New England to experiment with new varieties and colors. Everyone, not just those born in August should aspire to share the characteristics associated with the Gladiolus. 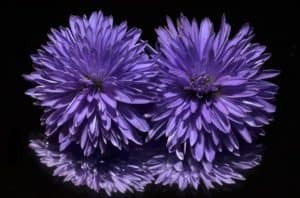 The aster is the official flower of anyone born in September, its connection with mythology is well documented as it was commonly placed on altars as an offering to gods because it was believed to represent love, wisdom and patience. It is said that Virgo (also the astrological name for people born during this month) , the goddess of purity and innocence , sprinkled stardust over the earth as an expression of her love. The stardust was the seed that caused aster to grow. What a magical flower to be associated with! 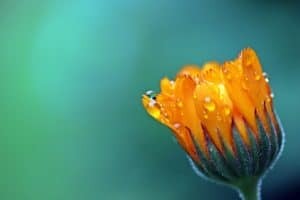 This tiny flower has a lot of meaning in connection with those born in October. Christian, Aztec, Hindu and many other religions have associated this flower with the sun and resurrection for thousands of years. In the Middle ages it was worn to attract new love, and in the Victorian era it was worn as a symbol of grief when losing a loved one. Thankfully, for whose birthdays fall in October it is now associated with charm, elegance and devotion. Also referred to as “mums”, the chrysanthemum is the flower for people born in November. This has been a popular flower dating back to the 15th century BC, eventually being brought from China to Europe where it was given its current name, which is a combination of the Greek words for gold and flower. While the chrysanthemum represents friendship, joy and compassion, it is mainly known for representing happiness. 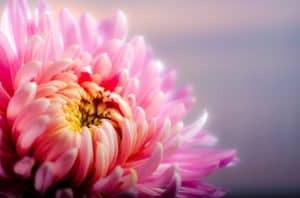 There is a chrysanthemum festival every year in Japan called The Festival of Happiness, although if you want to celebrate your birth flower at this festival you will have to do it a few months early as it is always held in August. 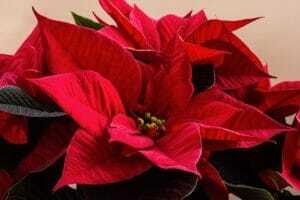 It won’t come as any surprise that the flower for people born in the December is the poinsettia. This classic Christmas flower has been a symbol of winter since the ancient Aztecs started cultivating them during the winter. The poinsettia actually got its name from the man who was the first Ambassador from the U.S. to Mexico when he brought them back as gifts during Christmas. If someone gives you a poinsettia for Christmas or your birthday, you can be sure they are wishing you good cheer and success.